7.6 x 2.2 x 1.9 cm. 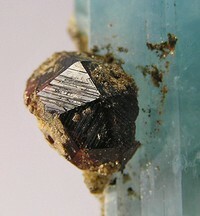 A DOUBLY-TERMINATED gem crystal of aquamarine, quite sizeable at 7.5 cm, with a spessartine garnet growing right on the side and adding a striking accent! The crystal weighs 31 grams. It has INTENSE color and superb gemminess. Ex. Wayne Thompson Collection.